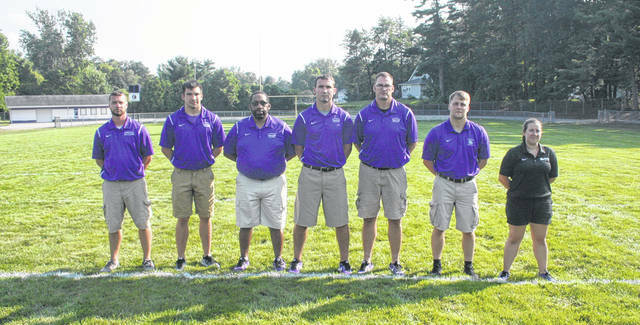 The 2018 Swanton coaching staff. Swanton’s returning letter winners for the upcoming season. The 2018 Swanton football team. The Swanton Bulldogs are aiming to make the football playoffs for a fourth straight year this season, after making it just once in the program’s history before that span. Last year, the Bulldogs finished 7-4 overall and 5-2 in the Northwest Ohio Athletic League. And they could have won a postseason game too, if not for having to face eventual state runner-up Eastwood in the opening round of the Division V, Region 18 playoffs. The Bulldogs have 24 letter winners returning out of 36 players, with seven of those being starters from the 2017 squad. As a result, Kerns likes the makeup of his team. Key returnees for Swanton are Michael Lawniczak (first team All-NWOAL, honorable mention all-district, league scoring leader), Xavier Williams (first team All-NWOAL, first team all-district, honorable mention All-Ohio), Dylan Gilsdorf (honorable mention All-NWOAL), Hunter Mix (honorable mention All-NWOAL) and Derek Floyd (honorable mention All-NWOAL). Newcomers for the Dogs are Josh Vance, Devon Crouse, Ryan Marvin, Conner Cass, John Townes and Ian Saunders. They will have to replace the likes of Gage Pachlhofer (first team All-NWOAL, first team all-district, honorable mention All-Ohio, Lukas Reiner (first team All-NWOAL, first team all-district, honorable mention All-Ohio), Anthony Howard (first team All-NWOAL, second team all-district), Crew Oberheim (second team All-NWOAL) and Noah Saunders (honorable mention All-NWOAL). If their offensive line can gel as a unit, Swanton should have some success running the ball with Lawniczak and Mix in the backfield. “We really like where our offense is right now,” said Kerns. “It’s getting a couple of those juniors or sophomores, that experience they need (to perform). The second-year coach likes the experience he has at key positions on the offensive line. Overall, he is encouraged by his team’s athleticism, their established belief in winning, and team work ethic and strength. On defense, it’s all about the back-end. “That back six or seven guys I really like right now,” said Kerns. “We think we’ve got enough guys up front on the defensive line. We’re not real big but we are athletic. We can do a lot of things as far as movement with those guys. Swanton will try to get the 2018 campaign started off right as they welcome Rossford on Friday. https://www.swantonenterprise.com/wp-content/uploads/sites/23/2018/08/web1_Swanton-coaches.jpgThe 2018 Swanton coaching staff. https://www.swantonenterprise.com/wp-content/uploads/sites/23/2018/08/web1_Swanton-letterwinners.jpgSwanton’s returning letter winners for the upcoming season.